Bill Belichick is known for being one of the greatest football minds in NFL history. He's also known for being one of the "riskiest" play-callers -- riskiest in quotes to emphasize that he actually plays to the odds rather than most of the conservative football minds. Down 28-13 in the AFC Championship game, avid Patriots fan Bill Simmons put it best: "Ravens playing to win, Pats playing not to lose." Belichick faced eight fourth downs in the game against the Ravens, seven of which were legitimate questions for the best course of action: Go for it, punt or kick the field goal. 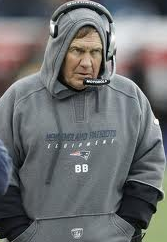 Whereas we would normally expect Belichick to be aggressive, he seemed more reserved in his decision-making. There are a ton of factors that could explain his passive play-calling. For example, it was extremely windy making field goals more difficult and maybe Belichick did not have faith that Joe Flacco could sustain a 90-yard drive due to the Ravens boom-or-bust offense (the Ravens ended up with three scoring drives of 10+ plays including a 90-yarder and 87-yarder). Let's look at each fourth down decision, starting with the very first. Remember in the beginning of the game, especially if the score is fairly close, we should look at expected points, but as score and time become bigger factors, we will switch to win probability. Also, note that these are league baselines. The fact that the Patriots offense is No. 1 in the league and far above league average would indicate a higher success rate on 4th-down conversion attempts. *This is a toss up decision and slight changes in the conversion rates change the decision dramatically. Also, up 3, all three decisions result in 61-62% win probability. As a result, we cannot reasonably say this was a poor decision. Again, like the other 4th-and-long in no man's land, small changes in the odds make a huge difference in the decision. All win probabilities are between 74-76%, although according to win probability, punting is the optimal decision at 76%. So, out of the seven questionable decisions, three of them were definitely toss-ups and a decision-maker could not really be faulted or celebrated (attempts 3, 6 and 8). Out of the remaining four, Belichick played by the numbers only once and forfeited 1.99 points (2.99 points if you include the two 4th-and-long from no man's land) and about 5% chance of winning. That does not seem significant given the final two-score outcome of the game, but those marginal subtractions add up. Optimal decision-making is not about making one call that dramatically exposes a market inefficiency, it's about the hundreds of incremental less than 1% edges that add up over the course of a season. Again, this should be qualified in that there are always external factors that could have been affecting the Patriots conversion odds and thus, their decision-making. As a favorite (and the Patriots were heavy favorites), you do want to play low-risk strategies -- albeit without forfeiting win probability -- and punting/playing the field position game is certainly low-risk. The biggest gaffe was punting on 4th-and-2 on the Baltimore 45, which cost the Patriots almost a full point. Outside of that, the suboptimal decision-making pales in comparison to the huge second-half turnovers and inability to stop the Ravens offense. Give credit to the normally conservative Jim Caldwell for staying aggressive deep into the fourth quarter rather than the typical three run plays and out we see when teams are in the lead. In fact, Caldwell called three straight pass plays (two incompletes and a sack), barely running any time off the clock midway through the fourth quarter while up two scores. Had the Patriots come back, he would surely have been criticized for not bleeding the clock, but Caldwell knew that the best way to win was to convert and extend the drive -- and score again, if possible. Congrats to the Ravens on another big upset, setting up the Harbaugh Bowl. Go crazy. The biggest problem with playing low risk/low reward when you're dominating the game like NE was in the first half is that you let the underdog hang around. I thought that NE should have gone for the kill on all the first half 4th downs. Instead they played conservative and let the Ravens hang around and get into the locker room where the coaching staff made great adjustments, especially on offensive play calling. One of the advantages the Ravens had was that because of their first half failure, they had to make adjustments. On the other hand because what NE was doing worked (even if they didn't have the points their dominance should have provided), they didn't see any need to make adjustments. Once the second half began and the Raven adjustments worked, NE wasn't able to make the necessary adjustments. In general I thought the NE got out coached. Les, I like your line of thinking. I've seen plenty of games -- the Baltimore/Indy playoff game a few weeks back! -- where the team that was ahead looked at the score and shook their heads saying "is it still really only that close?" The winning team has very little incentive to shake things up except for a harsh reality: they need to change SOMETHING because the other team is about to recalibrate. The Pats' offense looked desperate, trying anything to get five yards: end-around, reverse, double reverse, swing pass, screen against the grain, direct snap with a fake audible... it was bizarre how many different things they tried. Most of them met with moderate success, but I bet you Belichick's math on them said that many of them were 20-yard plays or even touchdown plays. Whoever prepared the Ravens defense with film study and coaching notes did an amazing job. I think setting aside all the baselines, the one that stuck out for me in the context of the game was the 4th down with 10 minutes left in the 3rd. And as per your numbers, it was a defensible decision to punt. They're in the middle of a nice drive that figures to put them up two scores, and the drive only stalls because Welker drops a 1st down pass the play before. Ironically, if the Pats go for it and fail and the Ravens go on and score a TD (which they did anyway on a 90 yd drive) the world blames Belichek for being over-aggressive. 4th and 8, and 4th and 9, are allegedly 'go for it' situations? That just doesn't pass the smell test. They are go for it situations because of the field position. A field goal is likely to be missed and put your opponents in good field position, and punting doesn't gain you much ground. The downside of a missed field goal or a bad punt doesn't make the upside worth it, while the upside of attempting a long conversion (TD or higher percentage FG try) is worth the downside of field position. Especially when you have a passing offense as good as the Patriots do. From the opponent's 33? Sure it is. A good punt will net 20 yards. A great punt nets a max of 32 yards. A lousy punt gets you 13. THIRTEEN. That's wiped out in one first down. That's not really worth it. Jon, a decent punt pins them in their own endzone. James, how often does a bad punt happen in that situation. Sure, it might bounce into the endzone, but you have a chance to drop the team inside their own 20 yard line. There is almost no chance of a return attempt. bottom line, i suspect the high rate of "success" on these 4th and ~10 plays are based on a shockingly low number of samples, and often happen at the end of a game where a first down doesn't really matter, and the D is playing to prevent a TD. One would probably be better served using 3rd down conversion rates. They average around 35%%, and that is not even filtering by distance. On decisions #4, while the EPs say to go for it, the WPs don't. Belichick sacrificed .9 expected points, but only 1% win probability. Maybe 1% win probability is pretty significant, but it doesn't seem vastly different from decision #6. The average field position after a punt in no-mans land is somewhere between the 10 and the 15 yard line. Yes, you could pin them inside the two, a predicament that comes with a few quirks beyond the gained yards. But the odds of that happening are rather small. 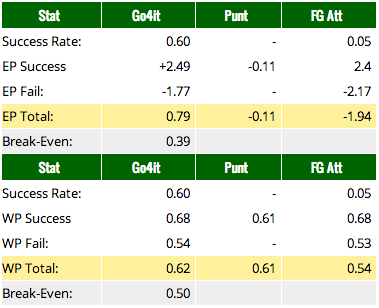 If the punt looks like it may not result in a touchback, the KR will most likely fair catch the ball where it lands. Pinning the team requires either punting out of bounds, a mistake by the KR, or a fortunate bounce. So the prospect of pinning the team deep is kind of a bill of good. Looking back, the punt was against the wind--that probably makes punting a more efficient option, like golfing against the wind, it makes it easier to drop the ball where you want. I still think going was the best option. Tom Brady is Tom Brady, and he's going to convert some more than the baseline average. 3rd down and 8 is converted 38% of the time, so I'm guessing that's the same number he was going off of. With one play to go, the % play is to kick the FG. What they should have done (percentage wise) was call timeout to give themselves a couple of shots at the endzone, then go for the FG. The NE punter was on fire. I know in theory you aren't supposed to take actual outcome into account, but maybe Belichick had reason to believe the actual outcome he got was much more likely than the models would indicate. What were the EP and WP results of the actual plays?